PRESIDENT Emmerson Mnangagwa yesterday broke his silence and gave a chilling account of his arduous 30km night journey on foot through Mozambique, while fleeing former President Robert Mugabe’s “hunting dogs” baying for his head early last month. Mnangagwa fled to South Africa shortly after his expulsion from government and later the ruling Zanu PF party on allegations of plotting to dethrone his 93-year-old former boss. facilitating his takeover from Mugabe, who resigned following a military intervention codenamed Operation Restore Legacy. He said Chiwenga would be “re-assigned very soon”, giving the clearest hint that the retired former ZDF commander was earmarked for the position of Vice-President. after walking some 30 kilometres crossing the border into Mozambique. 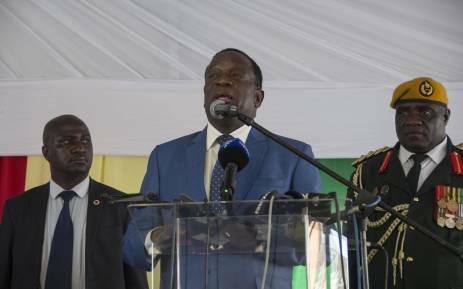 After I had been fired around 4 o’clock (on November 6), intelligence had made me aware of the next move intended to eliminate me,” Mnangagwa said. “Fortunately, I found a [business] card in my wallet which bore the name of a colleague here, (Justice) Maphosa, whom I phoned and he picked me. I came here and I was well-looked after,” Mnangagwa said to applause as a bespectacled man believed to be Maphosa stood up to be recognised. “Then, my colleagues back home asked me to come join them in moulding our future. This is the young man and I have banned him from putting on army uniform anymore. I retired him a few days ago, General [Sibusiso] Moyo,” the President said. Speculation is rife that Chiwenga would be appointed as Mnangagwa’s number two following the decision to retire him early this week and the appointment of former Zimbabwe National Army Commander General Philip Valerio Sibanda as ZDF chief. “And also General Chiwenga, I retired him two days ago, and he will have another assignment very soon and we will proceed. We had our congress last Friday and I was confirmed as Zanu PF president. Within six months, we will have elections which I hope to win,” Mnangagwa said. He was accompanied by Industry, Commerce and Enterprise Development minister Mike Bimha, Chinamasa, Foreign Affairs and International Trade minister Lieutenant-General Sibusiso Moyo, Transport minister Joram Gumbo, Presidential adviser Christopher Mutsvangwa, secretary for Information George Charamba and several senior government officials. Environment, Water and Climate minister and Zanu PF national chairperson Oppah Muchinguri yesterday briefly served as Acting President while Mnangagwa was on a working visit to South Africa. Chief Secretary to the President and Cabinet Misheck Sibanda said Muchinguri was appointed Acting President in terms of Section 100 (1) (c) (i) of the Constitution.